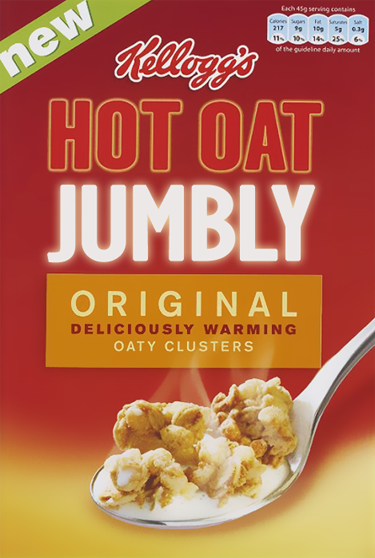 Kellogg's are proud to announce their brand new cereal, Hot Oat Jumbly. Produced in conjunction with Illogicopedia's foremost culinary talents, it's the Jumbliest, crumbliest cereal since... well, ever. Start your day the Illogical way with Hot Oat Jumbly. It doesn't even have to be Jumbly! It can be Novelniver, Ditzimber or even Jeremy. Heck, if you're feeling especially crazy, you can even enjoy it in Octodest! That's the beauty of this fantastic new all-day, all year breakfast cereal. Sample the delights of Hot Oat Jumbly swimming in milk, Ribena or molten ketchup for the full illogical effect. Eat in the bath, on the stairs, the bus or perhaps a hill overlooking wasteland with a fork, knife or curly straw. Why not add fresh peppers, chilli or other condiments for that extra spice? Wherever and however you decide to eat your Hot Oat Jumbly, we're sure you'll find it a pleasant and illuminating experience. Just remember to wear a bib or your mother might get a bit mad when you get unnameable substances all over your brand new breakfast shirt.